The calendar lines up perfectly for this year's Mayor's Cup Regatta and Festival for the City of Plattsburgh. "I think we will see an even bigger impact this year because it will be five days (including) the Fourth of July, and we will have a great lineup," Mayor Colin Read said. The party begins on Wednesday, July 4, with the celebration of the nation's birthday. The day will feature the traditional parade and numerous musical acts, culminating with the popular fireworks in the evening. The 41st-annual Mayor's Cup Regatta and Festival will kick off the next day, Thursday, July 5, and will run through Sunday, July 8. "It is a real treat for us to start the day after the Fourth of July," event organizer Joanne Dahlen said. The Plattsburgh Sunrise Rotary Club is once again helping the city organize and host the Mayor's Cup. "This has been a great tradition that we have been a part of, and we really don't want to let it go," Sunrise Rotary Club President Jim Snook said. The Fourth of July parade — with the theme of Champy, the legendary Lake Champlain sea monster — will begin at 1 p.m. from U.S. Oval, where lineup is slated to begin at noon. The parade route will wind along U.S. Route 9, to Bridge Street, then to City Hall Place, and on down Cumberland Avenue to the finish at Wilcox Dock. Parade entries can register at www.cityofplattsburgh.com until 4 p.m. Friday, June 29. The Mayor's Cup will no longer include the Boat Parade of Lights — that popular event featured decorated vessels of many sizes floating after dark on Lake Champlain from Wilcox Dock to the City Marina. It had to be canceled last year due to high winds. Dahlen said that rather than take another chance this year, organizers decided to re-shape the lineup. Taking the place of the Boat Parade will be the Great Champlain Kayak Chain and Lanterns on the Lake. Organizer Rich Jarrette said the event will feature kayaks and other non-motorized vessels, such as canoes and stand-up paddleboards, pushing off from the City Marina's small-boat launch at 7 p.m. Friday, July 7. The idea is to form a chain of boats out in the lake, where paper lanterns will then be launched into the sky. The event is free, and paper lanterns will be sold for $2 each. Jarrette said the event is designed to honor the lake and what it means to the region. "There is nothing like supporting this community, this resource, this water," he said. Another new water event this year will be the Thistle Class Sailboat Atlantic Coast Championships. Organizer David Hansen said the event will feature 17-foot sailing dinghies, all of the same design, that will face off in races on Saturday and Sunday throughout the day. He said he expects between 30 and 45 competitors from all over to compete in the races. "We expect boats from as far as Annapolis, Maryland; Rhode Island; Ohio; and all parts of New York state," Hansen said. The Thistle committee will staff a large tent on the lawn near the boat launch at the City Marina throughout the weekend. The actual Mayor's Cup Regatta will take place 10 a.m. Saturday on the lake, with the annual barbecue and awards ceremony slated to kick off at 4 p.m. at the Naked Turtle Restaurant. The Spirit of Ianelli Award will also be handed out at the ceremony. Dahlen said they expect about 75 boats in three divisions racing the course in Plattsburgh Bay. "It remains the largest sailboat race on the lake," she said. Registration for the boat race can be done on line this year, and more information about the event can be found at www.mayorscup.com. On land, the celebration Thursday through Sunday will include a host of bands playing a variety of music at the Macdonough Monument stage, Trinity Park stage and Strand Centre for the Arts. "We try to get a mix of local, regional and national acts, and we've got some very good ones this year as well," music organizer Lowell Wurster said. The Fire Truck Pull in front of City Hall will be back for its third year at 3 p.m. Saturday. And the 15th-anniversary version of the Mayor's Cup Bike Ride will be held on Sunday — the 50-mile version will begin at Whiteface Mountain in Wilmington at 9 a.m., ending at the Plattsburgh waterfront; the 20-mile ride sets off at 10 a.m. from Fletcher Allen Health Care Network, CVPH Medical Center in the city. The Plattsburgh Farmers and Crafters Market will be operating at its Durkee Street parking lot location on Saturday, and Trinity Park will be full of vendors and other activities for families. For $20, visitors can purchase the traditional Mayor's Cup T-shirt at locations throughout the city and county. Credit cards will be taken this year. 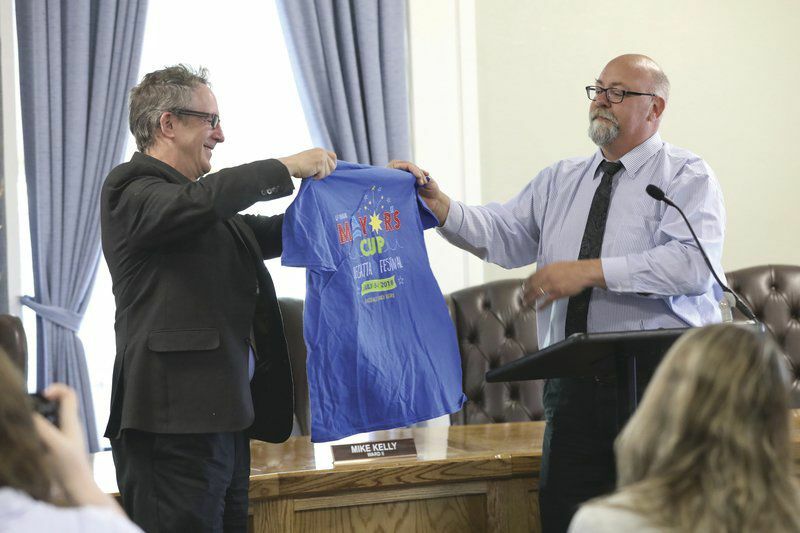 The T-shirt design was once again done by local artist Katie Jennette-Caska, featuring a whimsical sailboat as the "A" in Mayor's Cup and a bursting firework as the "O." "Every year, I say this is the best design we've ever had, and I am saying it again this year," Dahlen said of Jennette-Caska's work.